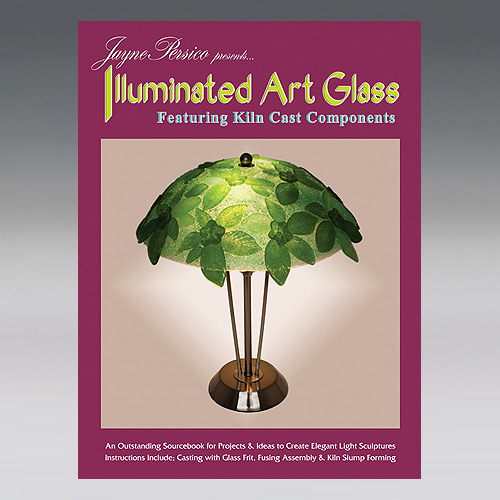 Illuminated Art Glass instructional book. Create Elegant Light Sculptures in Your Kiln with Instructions for Glass Frit Casting, Fusing Assembly & Deep-drop Slump Forming. Jayne Persico will transport you into a world filled with 'Illuminated Art Glass' through her mastery of color, light and high style. This book reveals her ingenious lamp-making process using all color photographs, detailed instructions and helpful design tips. You will discover an impressive array of glass kiln techniques from frit casting to tack-fuse assembly to ultra-managed slumping. This 80-page book features more than 160 color photographs enabling readers to examine these specialized techniques in depth and experience an expert's point of view and approach. Step-by-step instructions will guide the reader through 14 unique projects. Includes details on casting molds, tools, equipment, kilns, and a comprehensive look at digital controller programming. Glass trendsetters and style-makers from all walks are sure to find this book inspiring and enlightening.